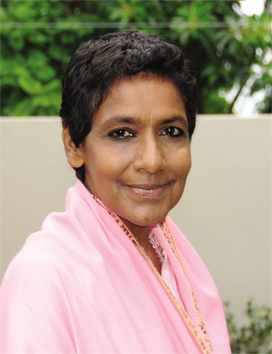 In interview with… Maya Tiwari, Ayurvedic international teacher and spiritual pioneer ! From the moment I contacted her until the moment I finished this interview, the smile never left my face ! Maya Tiwari is an internationally renowned teacher of Ayurveda, an acclaimed author, and recognized on the worldwide platform for her tireless commitment to inspiring health, wholeness, and peace. The least we can say is that relatively few women achieve such a notable status. Cancer survivor, with a diagnosis of six months to live, this New-York-based high-flying fashion designer, learned how to focus within, both spiritually and nutritionally, the hard way : “forced to reevaluate her life”. She retreated herself to a cabin in the Vermont woods, returned to her Indian ancestors’ Ayurvedic roots, and employed herbs, nutrition, meditation, chanting and yoga to heal. Since then, Maya Tiwari received the prestigious Dhanvantari International Award in 2011, and she’s also the recipient of the Rishi Award from the Association of Ayurvedic Professionals of North America (AAPNA) for her outstanding work in Ayurveda. For her dedication to creating inner harmony, health, and wellness in the world, Maya was honored with the distinction of World Peace Leader by the Parliament of the World’s Religions. Here, she reflects on “finding inner peace” and shows how Ayurveda’s ancient principles of health can help you to achieve the highest levels of physical, emotional, and spiritual well-being. My sincere gratitude. 1. Dear Maya, spiritual teacher, humanitarian, author, you are also called “Mother Maya”. How do you define yourself ? Maya Tiwari: I see myself as a woman in quest of the profound discovery of what it means to carry the Shakti (primordial feminine) force within my being. As a woman, I have traversed deeply into the womb of the Mother Earth- an arduous journey that has pieced me to the depth of being, surviving ovarian cancer at an early age, and thriving afterwards into the field of wellness and wholeness: After my recovery from ovarian cancer, I changed path and returned to my ancestral ground in India to study Vedanta, Sanskrit and Ayurveda. Recently, I was knocked down again, this time by a fierce force within the communal culture that advocated violent measures against me for seven years. These events have forced me to accept that here remained valuable inner work to be done. Through this harrowing experience that evoked deep rooted fears and cultural qualms I was fortunate to finally unlock the chamber of my womanhood and find where my karmic largess is stored. Throughout this deeply wounding journey, I never though I would find myself being grateful to the hundreds of perpetrators whom have made my daily life a living hell. But life is filled with miraculous revelations which I have been long privileged to, and naught else but these penetrating acts of violence upon my personal body and the ploy of fateful incursions onto my mind would have revealed the secrets of my long forgotten nature as a woman. For this discovery, I am profoundly grateful. I am sixty four years old, more than a survivor, I stand unscathed in my spiritually-elevated destiny. 2. You are one of the most prominent authors in Ayurvedic medicine. And beyond this, a spiritual pioneer as well, in the mission of serving humanity and awakening common consciousness. How do you explain the fact that so few women attain that status ? Maya Tiwari: Karma. The same karma that led me through the abyss of cancer and later on, a victim of communal violence, into the light. There are millions of remarkable woman in the world, doing amazing work for their communities and Mother Nature, the best of whom are hardly known. Women or man, we have to walk our destiny. The loss of my womb through cancer, brought me into an unusual state of the universal motherhood, that role I have unwittingly served since the age 25. Until a few years ago, I had no reason to pause, to reflect, to determine how it all came together for me. Once again, I was stopped in my tracks. This time, by the environs of hatred, and immense violence which persisted in and around my life for seven relentless years. In short, this critical passage tested my faith, scoured my soul, scrubbed the ego, cleansed the remnants of ancestral grief held within my vital tissues. On wobbly feet like a new-born doe, surrounded by the sage, and bamboo shrubs, under the watchful security of Mother Nature, I am to live again. 3. According to you, and through your life experience, how can we all take charge of our own life and health ? And what is a “Life of balance” ? Maya Tiwari: My answer to this question would be different if it were asked prior to my seven-year ordeal with experiencing unrelenting violence. First off, we must be careful to avoid new age platitudes. Each person is unique and has a different set of memories that drive them; one condition that works for all of us, is the ability to recognize when we are overwhelmed by whatever may be the present storm. In such instances, we must take cover, seek a form of solitude that allows us to go within and explore and acknowledge our emotional and physical state of being. Creating time and space to take pause from the norms, and be kind to the process, however hurtful, abusive or traumatic it might be. During the intensity of traumatic events, we tend to feel powerless, angry, fearful, restless, and unhappy. These are natural responses to deeply challenging situations. Accepting and knowing that these are the emotions we are experiencing begins to shift the state of trauma into a space of healing. Do not force yourself to go back to the daily norms, activities, habits, etc. Instead, seek out kind friends, understanding family members, and most of all, have faith in Mother Nature. Without thinking, go to her forests, streams, mountains, and desert. Sit and observe the serenity of her quiet and tempestuous grandeur. Ask her for mercy, ask her to help you reveal your lessons with ease and grace. Taking pause helps us to relearn our steps in a different way. We are continually seeking balance, and timely pauses help us to secure a state of equanimity. 4. As million of women in the world, you remarkably recovered yourself from a terminal illness by tapping into your consciousness. How can you explain that and how did you use your healing powers to cure yourself ? Maya Tiwari: I was very young at the time of my cancer odyssey, I was filled with enthusiasm for life and a vision that I was a conduit to help my ancestors heal from the brutality of their experience of being carted off like bales of cotton from the Motherland of India. In 1889, their arduous journey across many oceans under horrific conditions was later documented. Their destination was Guyana, then part of the British Commonwealth. From the start, I saw my cancer condition as being indelibly linked to the grievous memory of my female forebears. Having experienced a privileged, but challenging childhood infused with ancestral stories of angst, tears and grief, I set out to New York City to continue my education. At an early age, I sought fame, and fortune as a clothing designer. At the height of my successful fashion career, I was struck down by ovarian cancer. I was 23 years old. This was the environment of consciousness surrounding my disease. During my cancer years I lived on the subtle plane, cognizant of the grey grief of my female ancestors; of the unequaled thirst for truth within me. I had frequent “visits” from the Goddess Mother who instructed, guided and shared forecasts of my journey ahead. Although medical prognosis of my condition was grim, I never doubted that I would survive my disease. The critical truth was, I was not committed to living. For too early and too long, I had borne witness to the ugly realities that exists among humankind, filled with fragility we carry forth within the fragile body, mind and spirit. 5. Through this experience, do you see there a chance for the humanity to heal the world by collective effort driven by consciousness ? If so, does your work reflect that intention ? Maya Tiwari: What is “consciousness”? Very few understand the meaning of this principle. We have the long strokes of new age platitudes, half-cocked truths, and popular wordology (viz a viz the so-called philosophers of our time). We are a world living with vulnerability, fear and immense fragility. The scribes of truth are living in caves, deliberately isolated from human-kind, or live lives necessitated by inebriation – a potent form of immunization necessary to utter the truth of our mind/body experiences. In my not so humble opinion, those of us who experience the consciousness for change must strive to gather the truth of our own purpose, unfettered by commercially-driven desires, and come forth to advocate kindness, love, forbearance, not by word, or speech, or public deed but simply by the act of truth and honesty in our own private lives. I do hope that my work of 40 years teach this lesson, one that I’m continually improving upon and learning. 6. Maya, in one of your books you talk about inner medicine and women’s power to heal. Does it mean that women have a particular potential to heal ? Maya Tiwari: We are at the focal point in universal time when the emergence of Shakti awareness, feminine primordial power, is imperative for reforming collective consciousness where we thrive in cooperation, kindness and love with each other. Women are synonymous with Mother Earth, we are her sentient Shakti force at dynamic play in the world. Our sacred primordial duty as a woman is to share, process and transform pain and anguish into wellness and joy; violence and abuse into peace and compassion, betrayal and deceit into kindness and gratitude. This is our innate Goddess given power of the primordial feminine force. As women,we need to relearn and reinvoke these powers within ourselves and apply their practices to heal the living environment of the Mother Love. 7. As a spiritual pioneer, do you feel that the next generations will be more connected to their own healing powers ? And how can we, as parents, help this process ? Maya Tiwari: The next generation have both the karmas of grandeur of a more refined, kinder ancestral memory, the long years of time ahead of them, as well as the crushing reality of being inundated by technology, its gadgetry and absence of the moment. We shall see. 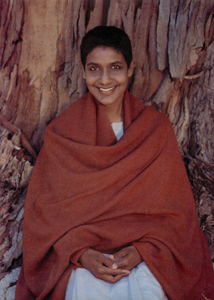 Maya Tiwari is the author of many books on health, wellness, and spirituality, including Living Ahimsa Diet: Nurturing Love & Life, Women’s Power to Heal: Through Inner Medicine, The Path of Practice: A Woman’s Book of Ayurvedic Healing; Ayurveda: A Life of Balance; Ayurveda Secrets of Healing, and Love! A Daily Oracle for Healing. Next In interview with… Dr Assem Adylbayeva, Ayurvedic practitioner in Moscow ! Powerful interview. Brought tears, we wish love, and gentle days to this grand lady. This is a great post..